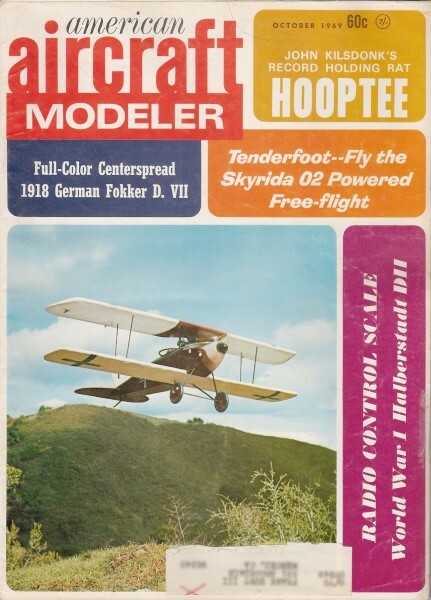 Website visitor Bob G. of Salt Lake City, Utah, wrote to request that I scan and post this PeeWee .020-powered free flight model that appeared in the October 1969 edition of American Aircraft Modeler, called "Skyrida." Bob remembered seeing it in the magazine when he was a kid and hands decided now that he is back into model airplanes, it would be nice to try his hand at one. Model airframes are not all that Bob builds, however; he also likes to build the engines that power them. Hopefully, one day a photo of his model Skyrida and his engine will grace this page. 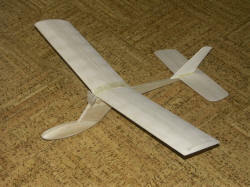 As promised, Bob G. sent a photo of his complete Skyrida airframe. He says all he needs is to install the engine and get a break in the snowy weather to be able to go fly it. Gas-powered free flight offers an exciting challenge. 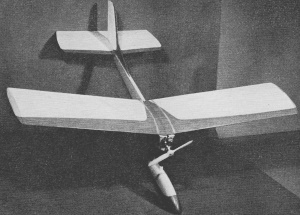 This small-field flyer features rugged construction. SOMETHING different always catches the eye and this old saying is as true for the novice, as for the old-timer. 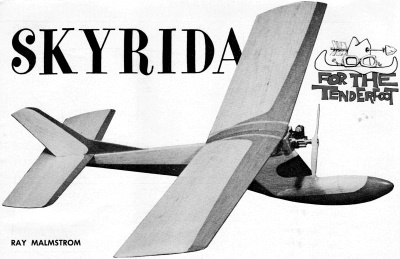 As model aircrafts go, "Skyrida" certainly possesses that excitingly different look, and when we tell you that you will find it easy to build, and to fly, then our guess is that you are already reaching for that balsa knife. So let's go! 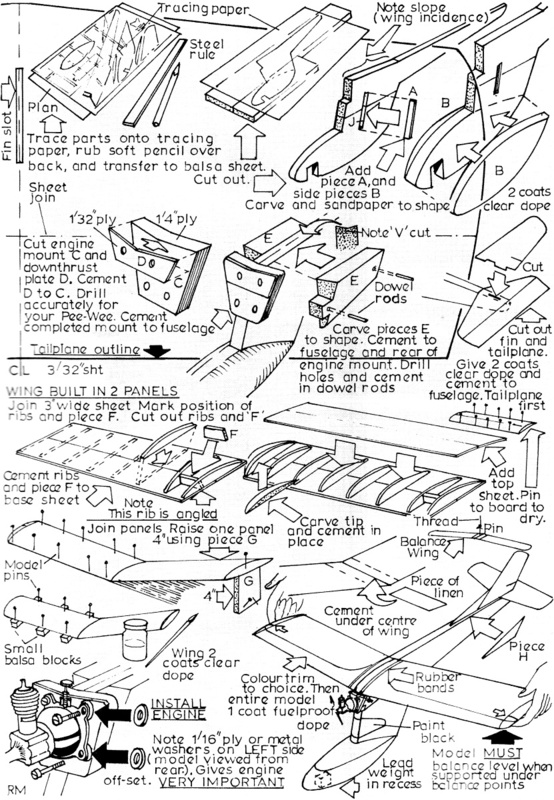 You will find the "easy-build" sketches will give you all the info you need to build yourself a Skyrida quickly and easily. Work on a flat board (white pine, plywood, etc., are all suitable). Use a sharp knife (we prefer a really sharp single-edge razor blade) and a medium and a fine grade of sandpaper for shaping and finishing the parts. Remember to sandpaper all surfaces lightly between coats of dope. Only one side of the wing and stabilizer are shown, so simply reverse your tracing for the opposite side. Easy! Check when you cement the stabilizer in position that it is at right angles to the fuselage, and the fin is truly upright. A carpenter's square or small T- square come in real handy here. When bolting in your Pee- Wee 020 engine, make sure you offset it to the right (model viewed from the rear) with either two 1/16" ply or 1/16" - thick metal washers. This is most important. By the way, if a Pee­Wee 020 is a new engine to you, be sure and run it on a test bench first, and familiarize yourself with the starting procedures and fuel setting. Fuel-proofing with several coats of clear dope is required for powered models. Easily started Pee Wee 02 engine is recommended. 1 piece linen or gauze 3 x 5-1/2"
A word or two on "balancing." Because sheet balsa varies a great deal in weight from sheet to sheet, when you have built your wing, it is a good idea to balance it. Suspend it upside down as shown in the sketches and see that the wing hangs level. If one side is heavier than the other, add a very small amount of clay to the tip of the light side. And now for the second and equal-ly important balancing act. 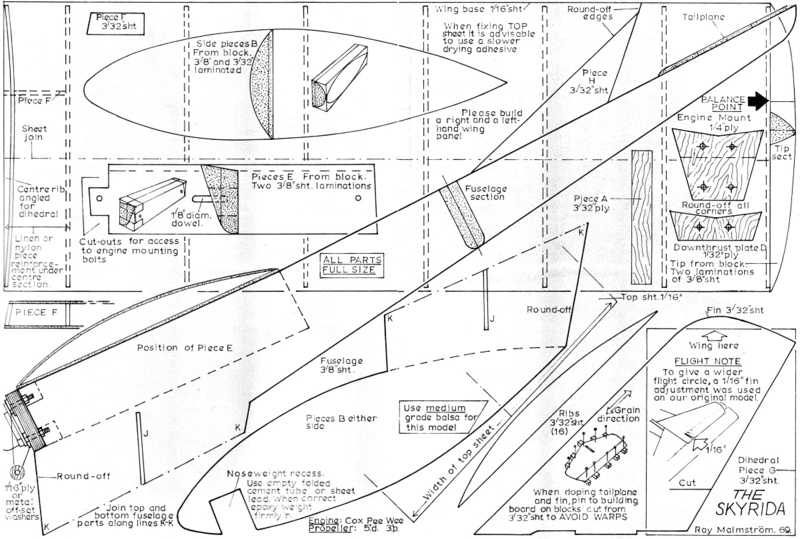 When your Sky­rida is ready for flying, support it with the tips of your forefinger, under the balance­point marks on the wing tips as shown on the plan, and in the easi-build sketches. Your Sk yrida will need a little weight in the nose-weight recess. Add or take away weight until it balances level. Avoid any suspicion of tail-heaviness. Choose a calm day (or evening) and some long grass for first glide and power tests. From a shoulder-high launch (into any slight breeze there may be) with the nose pointing slightly downward, the plane should touch-down about 15 yards ahead of you. Check to see that the glide is straight. A turn in either direction can be checked by slightly warping the rear edge of the fin in the opposite direction to the turn. If your Skyrida dives, gently warp the trailing edge of the stabilizer up and vice-versa. Make all adjustments no more than 1/32" at a time. The fin and tail surfaces, like any well-designed real aircraft, are quite sensitive; so a little at a time. Now comes "the moment." A first power­on flight! Start your Pee-Wee and adjust it for smooth running, then face into the breeze and launch steadily and smoothly. Never in your excitement throw the model. The plane should climb steadily away in a left-hand turn, and continue to climb in the same turn until the fuel runs out. It should then settle into a fairly straight, flat glide. 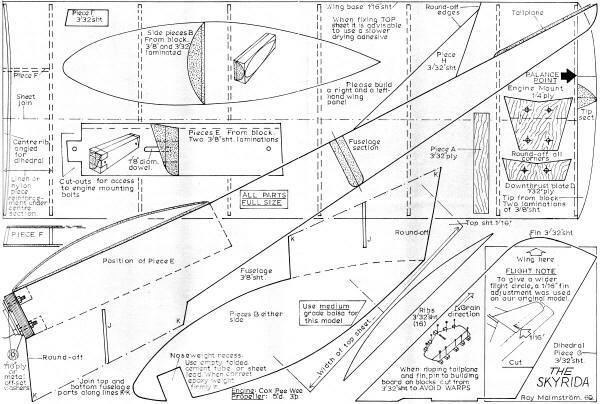 We found that by turning the rear edge of the fin just 1/16" to the right (viewed from the rear) as shown on the plan, we got a wide left-hand turn under power, and a sweeping right-hand circle on the glide - a most pleasing flight pattern. Skyrida is happiest when flying to the left under power, so keep her that way. All the best, and high-flying to you. 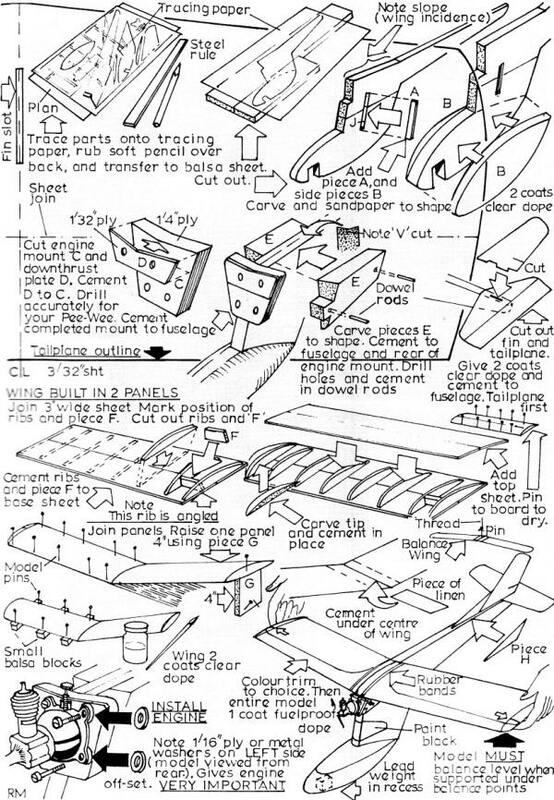 Not only is construction sequence shown but also outlines for tailplane right half. Reverse the outline for left half.